Stop by the NGC table at the Whitman Philadelphia Expo to drop off your regular grading submissions. NGC will be accepting regular submissions for all service levels* at the Whitman Fall Expo in Philadelphia, at the Pennsylvania Convention Center in Philadelphia, PA on Thursday, September 19 to Saturday, September 21, 2013. All submissions will be sent to our office in Sarasota, FL. Services include World Services, Ancient Coin Services, Bulk, PHOTO PROOF® and more. Check with show representatives for details. Cut-off time for all submissions will be 11:00 a.m. on Saturday, September 21. 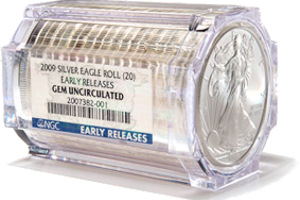 Due to the special handling required, NGC does not accept submissions of the following coins at this show for regular service submissions to be returned to the NGC offices: Coins over 3.5″ (90 mm) in diameter and .39″ (10 mm) in depth, 2013 American Buffalo One Ounce Gold Reverse Proof, West Point 2-coin set, San Francisco 2-coin Proof set, Coin & Currency sets, 25th Anniversary Eagles, 20th Anniversary Eagles, Early Releases, American Liberty Series and 10th Anniversary Platinum Sets. These submissions must be sent directly to Sarasota, FL, by the submitter.